The Christmas holiday is just around the corner. We can feel the crisp air and the cooler nights. Different Christmas decorations are now displayed all over the place – around the neighborhood, in the malls, churches, and even our offices. If you prefer prefer holiday decorations that are different than the usual Santa Claus, snowmen, and Christmas lights, check out these great indoor holiday plants instead. Be eco-friendly! Remember, plants provide oxygen. They also clean the indoor air while providing holiday warmth. Poinsettias are one of the traditional Christmas symbols. The red and pink leaves that resemble petals add color to any room or space in your house. Poinsettias love bright and humid locations. You can group this typical Christmas decoration in mono-color or mix them up. These living accents go with the holiday decors so well. They also make a perfect Christmas gift. The Christmas Cactus is a tropical plant with flattened leaf-like structures and ruffled flowers on tips. They come in different colors of red, fuchsia, orange and cream and they grow best under bright indirect light and moist soil. They will produce flower buds when placed in cooler temperatures for 6-8 weeks. Arrange your Christmas Cactus in a decorative container. Add twigs and stems to enhance the look for an instant ornate display. You can place them on the counter tops of your kitchen or windowsills for a joyful touch throughout the holidays. Amaryllis, also known as naked lilies, comes in white, crimson, pink or purple. It is one of the best in the bulb family. Each bulb grows produces 1-2 leafless stems. Each stem bears a bunch of 2 to 12 funnel-shaped flowers at their tip. Each flower has three outer sepals and three inner petals. Amaryllis can be used in a flower arrangement. Amaryllis also makes a unique and clever gift. Plant an Amaryllis now. Watch it bloom and make the spirit of Christmas come alive! 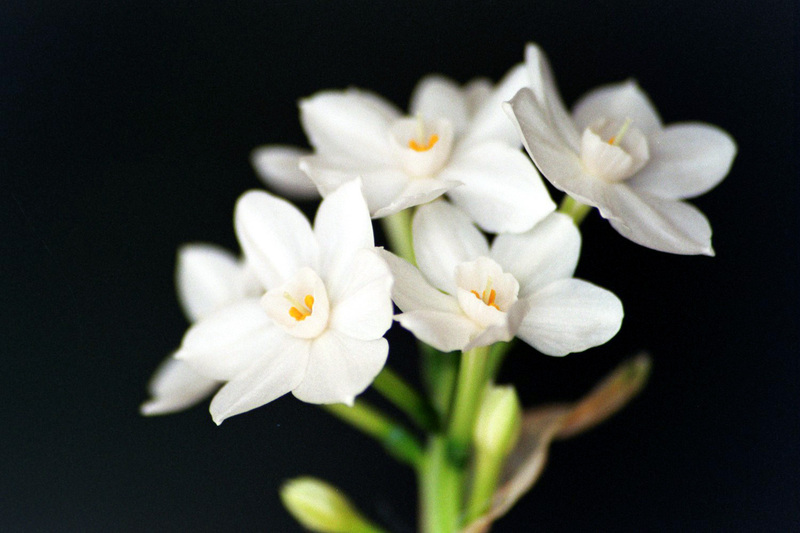 Paperwhites are the most fragrant of all flowers. They are perennial bulbous plants that bear trumpet-shaped flowers. Paperwhites ordinarily come in whites, but they are also available in yellow. They can be grown outdoors during warm climates, and indoors during winter. Although paperwhites do not usually bloom during winter, they make wonderful holiday gifts. .
Cyclamens bear large red, white, or purple flowers. They are considered temporary houseplants because they die after the flower blooms. Mini moth orchids are perfect choice for a dramatic centerpiece on a dining room table. Their exotic shapes and stunning white, pink and speckled blooms will surely enhance any room in the house. They can be used as a standalone or they can be grouped together. Decorate it with a sprig of greens and you have an instant, high impact decoration! Norfolk Island Pine stands from 14-44 inches when you find it on sale; however, it will grow more than 6-foot tall after few years. The pine tree will make a good substitute for your artificial Christmas tree. You can decorate it with ribbons, balls, and miniature lights. The initial investment is well worth it. Enjoy the holidays and give your home a unique touch with these festive and colorful live plants. 6.5 or 7.5 fully decorated Christmas Tree and three 8" poinsettias for under $500.00. This is a special so call before our supply of trees runs out. Here are some of the places that we like to go...we hope you'll visit them too.